Selecting a practice management software system is about encompassing everything you need your technology to do. You don’t accommodate the software, the software accommodates you. 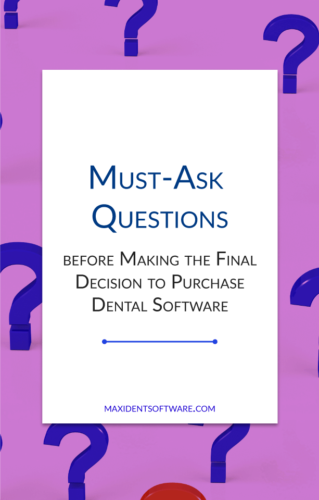 In order for you to be satisfied that your software is doing just that, it’s important to ask the right questions. Are you planning on changing your dental software, or, more importantly, is this your first dental software program? How does this particular software benefit my practice? The software provider should be able to answer this question easily with a little help from you about the size of your practice, how many computers, and potentially how many patients. They can then inform you about what their software can do for you and your team. It’s always important that if you notice the provider descending into techy lingo, to call them out on it. Ask questions, ask for clarification, and make sure that you come away with a complete answer you definitively understand. Do you own a PC or a Mac? Do you have a 1T hard drive or a 100G hard drive? Have I already lost you? To properly implement software, do your homework. How do you do that? You can either find the answer by simply going to the company’s website (eg: https://maxidentsoftware.com/downloads/documents/Maxident_Hardware_Requirements.pdf) If you, however, cannot find the answer by googling it or checking the website, ask questions. For example, What are the hardware requirements for this particular software? Can I use this on a laptop? Can I access this on my phone or tablet? Whatever question you can think of, ask it. Don’t be shy or nervous. Ask them anything that pops into your head. I guarantee every question you ask is valid. Also, be sure to always ask “What does that mean?” when you don’t know, so that you can make the software decision that best suits you and your practice. Uh oh, they’ve used an acronym that has completely escaped you. You might have heard the term before but you’re still not entirely sure what it means. Here’s the deal, even if you do have a slight inkling of what a certain acronym stands for, it’s always beneficial to ask for clarification. We all use acronyms in our line of work that only make sense to those in the industry. Dental professionals use them, too, and usually, the reaction is an eyebrow raise and squinty eyes of confusion from anyone who is not a dental professional. In response, a patient (such as myself) will ask, what does that mean? And it’s okay. I know you’re not judging me for not knowing your lingo just as a software provider won’t judge you for not knowing theirs. Obviously, you want to make sure all your data is protected, which is why this question is so fundamental to your purchasing of software. Will the software support an antivirus? Is there a specific antivirus software that can or cannot be used? These questions are valid and your software provider should be able to answer them with as much detail as possible. The drawback to forgetting this question is that some software systems are not equipped to handle certain antivirus software and this can cause issues anywhere from small annoyances to issues that can bring down your entire system. What kind of service support will I get with this particular software? This is another profoundly important question to ask because, let’s face it, all software has its bugs and all of us have our questions. Whether you need support twice a day or once in a blue moon, you need to know that support will be there for you. Thinking about adding Digital X-ray software? Will other imaging devices, such as an intraoral camera, be used with this system? If so, how well will they integrate? What do the other members of the dental team think? Are the company and product reliable? What warranty, upgrade or replacement offers are available for the equipment? What is included in the service agreement and what is the fee? No matter what technology you implement in your office, it’s important to ask questions and share with your team. When it comes to purchasing practice management software or imaging software or any other kind of software, it’s imperative to your practice and your team that you do your homework. Make sure the software is reliable and has some kind of insurance to fall back on in case equipment breaks down. Further, you should be able to access updates and upgrades that might be available for the equipment. Plan, research, and be prepared so when the time comes to purchase, you will have no doubt that you have chosen the right software for you.